How do we educate senior leaders for employee engagement? What follows was my immediate response to the question. I am not sure we have to have senior leaders become undercover bosses pretending to be employees. Senior leaders must always remember that they are employees! The job is not to go undercover but to discover the impact the organization is having on employee engagement. First – Remind senior leaders that they are employees! Therefore everything that applies to all other employees can also apply to them. Second – I would not use the word training with senior leaders and I am not sure “training” is suitable for any employee. I prefer education and leaders need to know education is as much about what they give as about what they get.They are not trainees they are part of a learning community brought together to make a difference in learning, engagement, and performance. Third – I wrote a popular piece: 21 Sure-Fire Ways Leaders Can Energize Themselves for Work. You are welcome to use it. Fourth – Crucial Conversations is a good methodology for them to achieve mutual purpose and mutual respect leading to results that matter to all. I so much appreciate the compelling evidence that Jane Dutton and Ross School of Business have gathered to show the most powerful contributor to organizational energy is high quality interactions or connections. Leaders may need help knowing how to show up, be present, and engage so that is is real, valuable, and has impact. Fifth – I would be tempted to have them experience a little bit of the invitational conversation that Peter Block offers in Community – The Structure of Caring. Pages 177 to 185 are a very good summary and Peter encourages people to freely copy and distribute this section of his book. Fifth – I think about my work teaching The Influencer and getting Senior Leaders to focus on the 2 or 3 vital behaviours that will get the measurable result they are after and then stacking the deck to ensure this occurs. We need to keep our efforts small and significant and most leaders already have a plate that is overflowing and we don’t want them to experience engagement as one too many meatballs. Sixth – I would introduce them to the work of Sandy Pentland and show them how technology now allows us to monitor and measure honest signals and that our honest signals play a huge role in communication and change. They don’t need to wear a sociometer or wocket but they should understand how important it is for them to model and express congruent integrity. 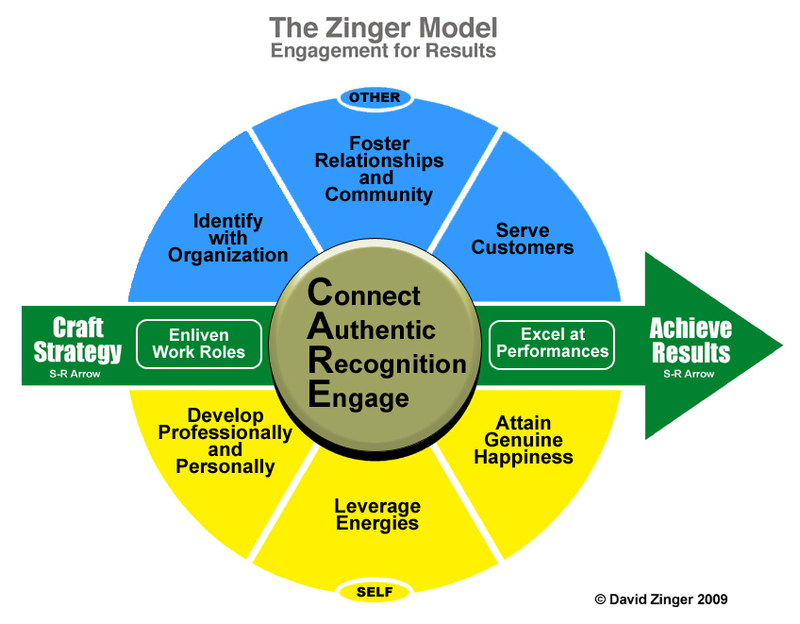 Seventh – They need to know that engagement is not a fluffy extra or a soft skills. (How I detest the word soft skills because it makes our human skills seems mushy and fluffy – I would prefer that we use fixed and fluid skills and communication and people skills are the fluid elements that keep the fixed pieces working) I believe that engagement is how we work in 2010 with: co-creation, conversation, social media, strategic improvisation, postmodern management, etc. Jennifer, I am glad you asked for this as it just made me realize that my approach to leadership engagement is taking a more articulated form when I can write this off of the top of my head and from the caring of my heart to reach out and get results that matter to all. What do you think? If you would like to respond to this forum join the Employee Engagement Network and click here. David Zinger, M.Ed., is an employee engagement expert. He offers exceptional education and consulting on employee engagement for leaders, managers, and employees. David founded, moderates, and co-hosts the 2037 member Employee Engagement Network. His website offers 1000 articles relating to employee engagement and strength based leadership. I agree – engagement is not fluffy — it’s the key to results and flow. I like your point on Crucial Conversations for everything from shared pool of meaning to just an overall more connected team. I would add that “vulnerability-based trust” is a key component for folks going out on a limb (it’s the “who’s got your back test”) and I would also add that the principles in Good to Great really help establish an engaging culture. Trust and learning loops and quality go a long way. Very good points about “vulnerability-based trust” and the trust learning and quality. Good enrichment and addition.